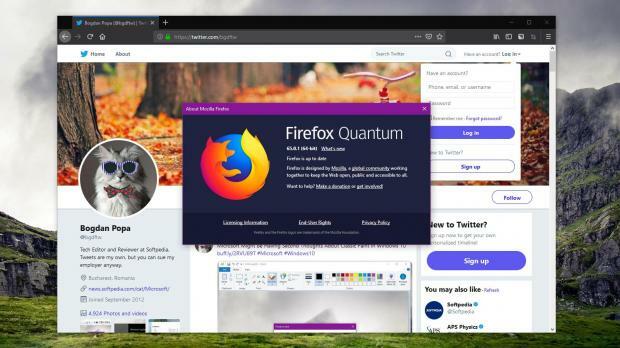 Mozilla has recently released a new version of Firefox browser, bringing the application to version 65.0.1 on all supported desktop platforms. Firefox 65.0.1 is the first minor release of version 65, and it doesn’t bring any new features, but only fixes for a handful of bugs and security improvements. For example, this new Firefox update comes with improved playback of interactive Netflix content, as Mozilla explains. While no specifics were provided, I expect Netflix content to run smoother now in Firefox, with resource usage likely to drop too. Additionally, this version fixes an issue causing delays and impacting video size when making WebRTC calls, while also resolving a color management bug on macOS. Mozilla says that it also addressed a glitch that caused add-on recommendations to make a call to Mozilla’s AMO website before the install button was clicked.Security patchesThere are several security vulnerabilities resolved in Firefox 65.0.1, all having a high severity rating. One of them is an integer overflow in the Skia library and it was discovered and reported by Ivan Fratric of the Google Project Zero team. “An integer overflow vulnerability in the Skia library can occur after specific transform operations, leading to a potentially exploitable crash,” Mozilla explains. This new version of Firefox is also offered via the built-in auto-update engine that the browser bundles. Previously, Mozilla stopped offering Firefox 65 using this method because of compatibility issues with a number of antivirus products on Windows systems. All the other platforms were still offered the automatic update to Firefox 65. You can download Firefox for Windows, Linux, and Mac from Softpedia using this link, and given that this new version resolved critical security vulnerabilities, you’re recommended to update as soon as possible regardless of platform.